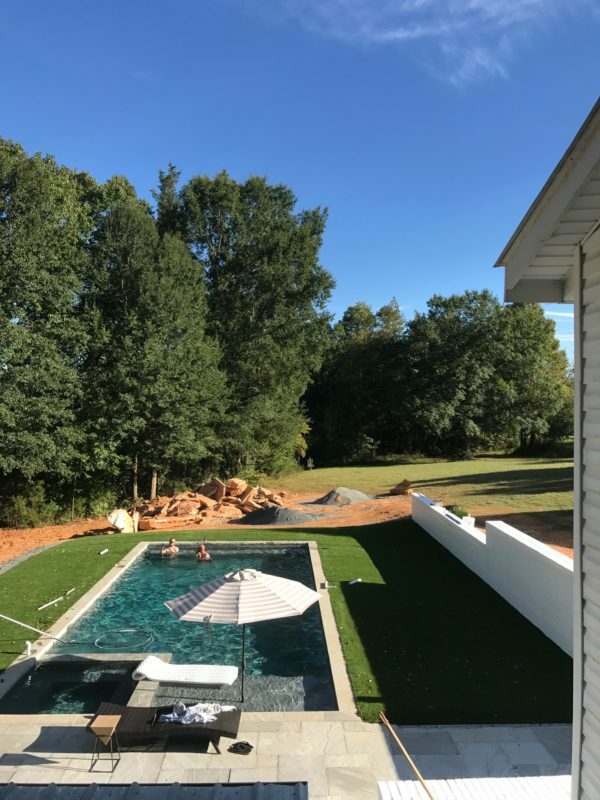 We started tearing up our old backyard in March 2017, we did it DIY style with the help of friends who are professionals — a landscaper, a builder and lucky us–an amazing pool designer. It’s not quite done yet, but I’ve never been one to hide the process until we had a big perfect reveal. 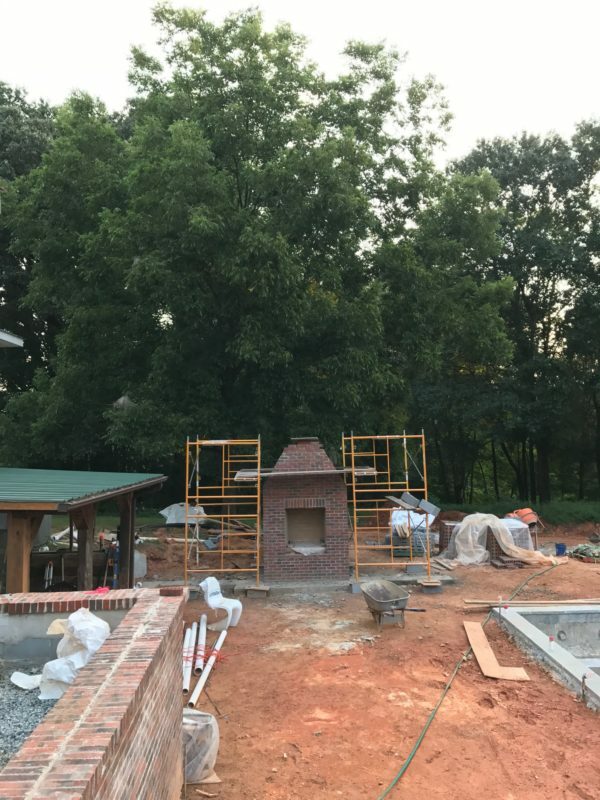 So here we are 8-9 months into the biggest project we’ve ever done–completely rebuilding a pool, and adding a patio and fireplace area to our backyard. The backyard when we first toured the house in 2013. Oh look, this house has a pool! 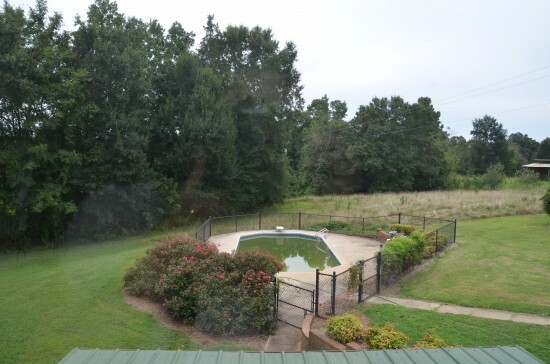 This is what the pool looked like when we bought the house. It wasn’t much of an asset, it was more of a liability. 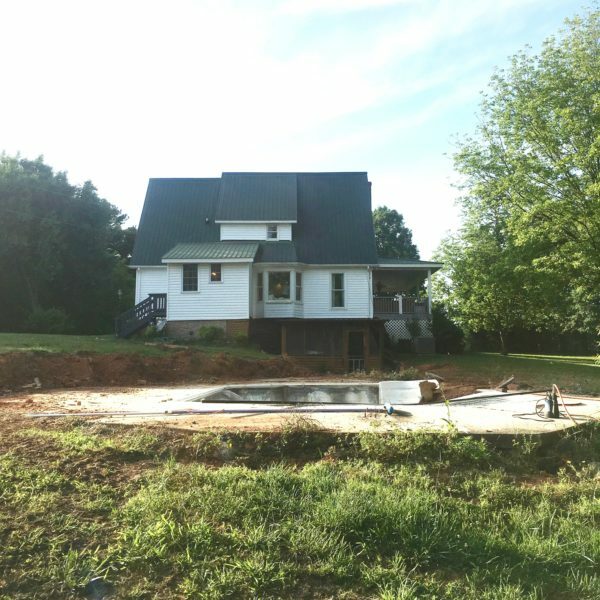 We bought the property in spite of the pool, but I secretly hoped that one day we wouldn’t just fill it in, but completely redo it. 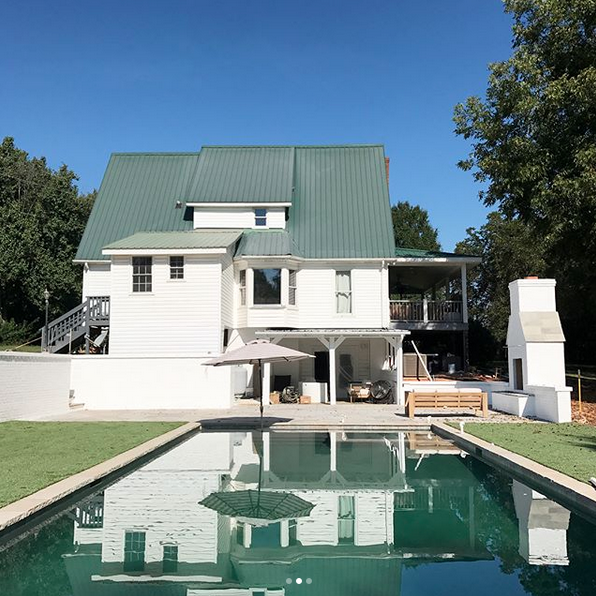 We were not looking for a house with a pool and I never even considered having a pool, it was just here and we knew this was the house for us. So now we have an old green pool. Yippie? I grew up going to Donner Park pool in Columbus Indiana–all of my best childhood memories take place there. 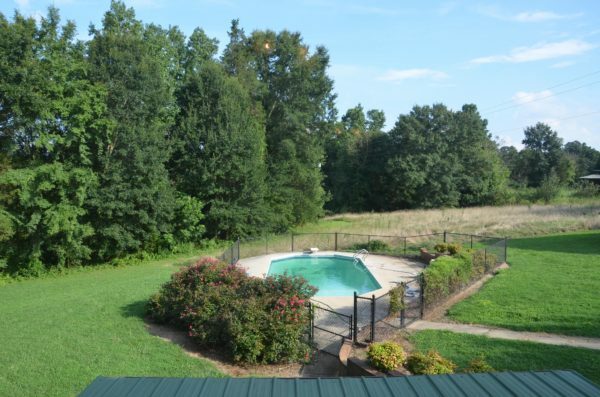 Once we had the boys, I’d save money all winter so we could join the pool each summer in Greensboro, North Carolina. One year I even cried literal tears on the last day the pool was open. I am a Pool Girl. I absolutely love floating in a pool by a pool and think it’s one of the most relaxing, enjoyable things possible. I never ever dreamed we’d have a pool in our backyard. 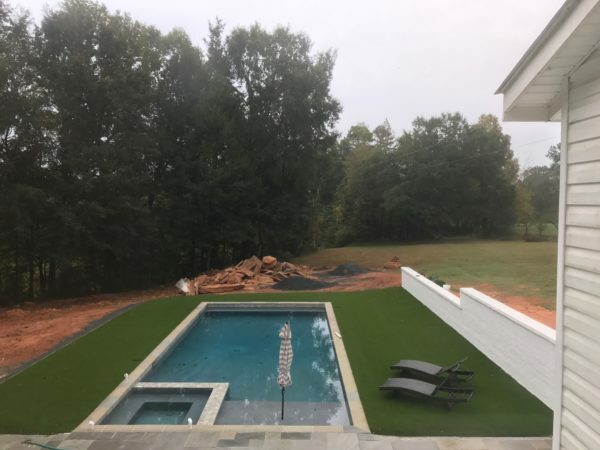 So buying this house with the green pool both excited and scared me. It’s no secret that I will and already have used this old pool and the new pool more than anyone else in our family. 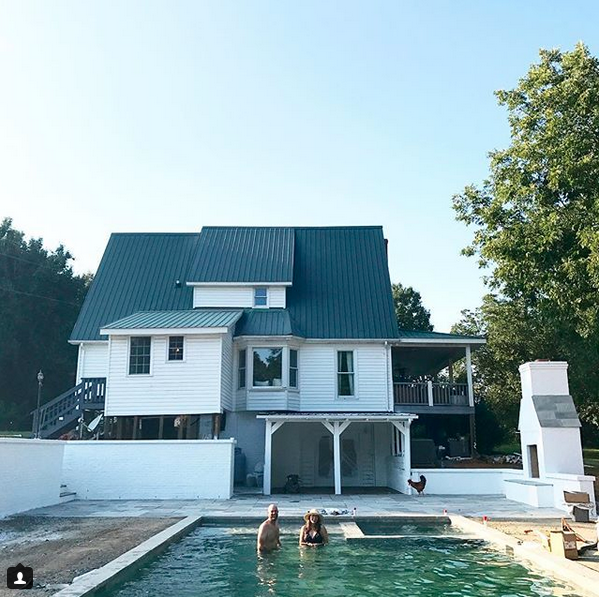 Once we bought the house, Chad called his high school buddy Tell who just happens to build amazing pools and they had the water looking as good as it could within a week or so. But, the old vinyl pool had rips, a broken main drain, multiple leaks, broken stairs and a cracked patio. It was actually in fantastic shape for being built in 1989ish but pools like this were not built to last for 30 years. We were able to get 3 more summers out of it thanks to duct tape, two hoses always in the pool, and avoiding the stairs. We couldn’t just redo the pool without considering the rest of the yard. 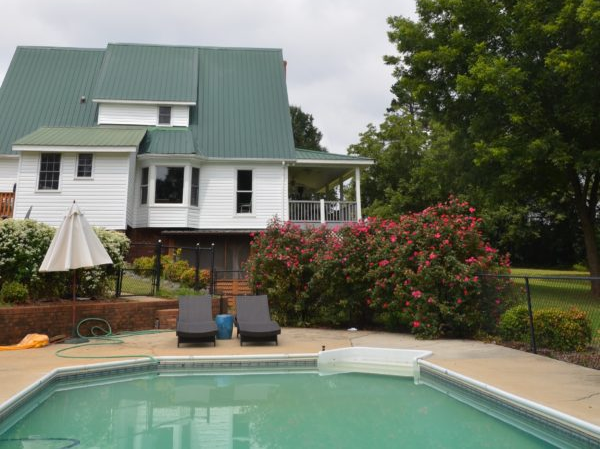 The fence around the pool felt prisonlike–and the pool felt really separated from the house. Also, we had a wall problem. 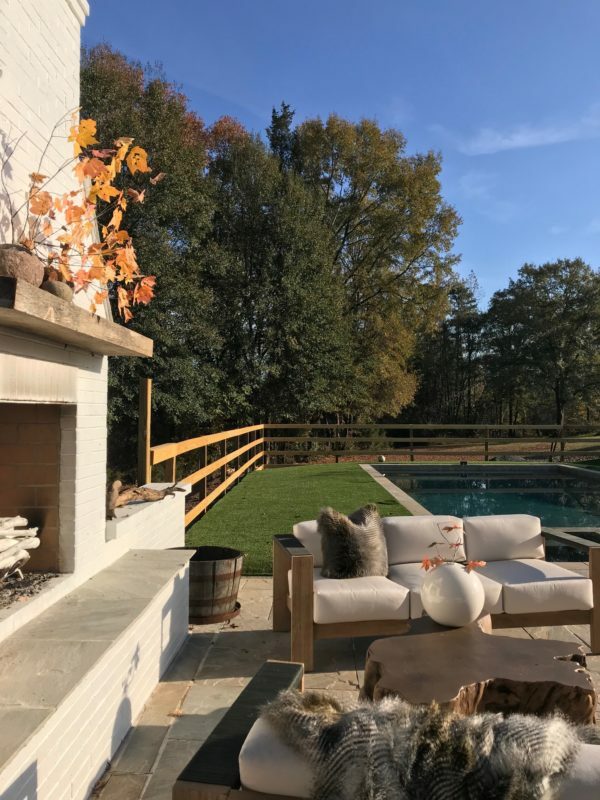 See how the brick retaining wall comes to a point behind the two lounge chairs? If you line it up to the house, it lines up with the left side of that skinny window on the right. The retaining wall was so awkward, cutting up the usable space in our backyard. 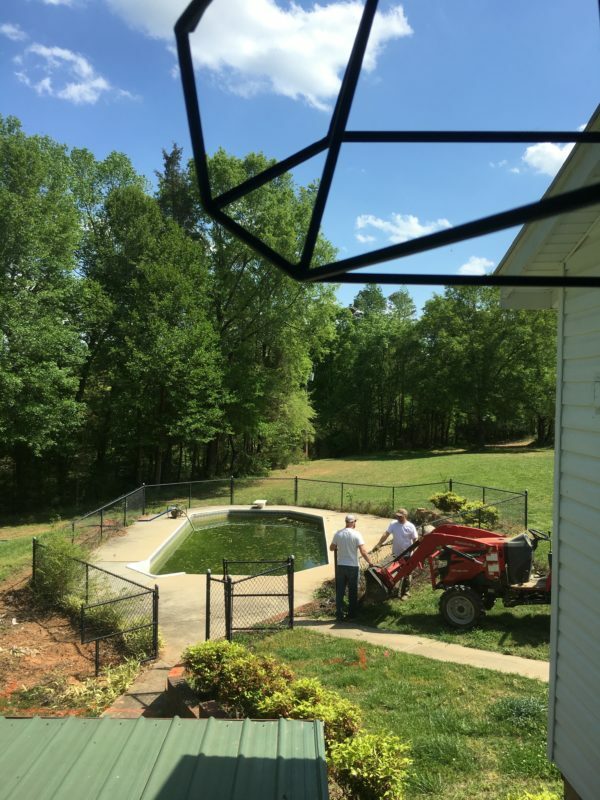 We knew that updating the 30ish year old vinyl pool and patio would require more than just attention to the pool. 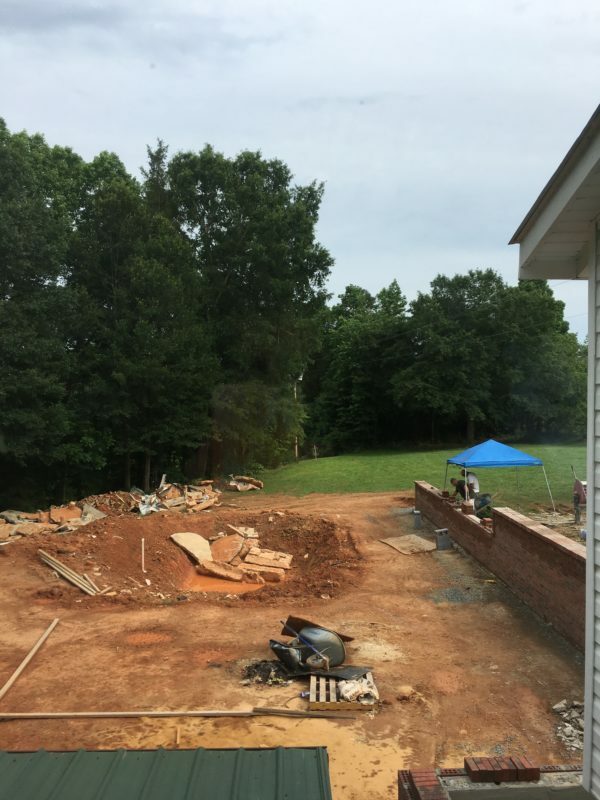 We would have to remove the old retaining wall and build new, longer walls that made sense for the space, in order to have a usable backyard patio area that didn’t feel separated from the house. 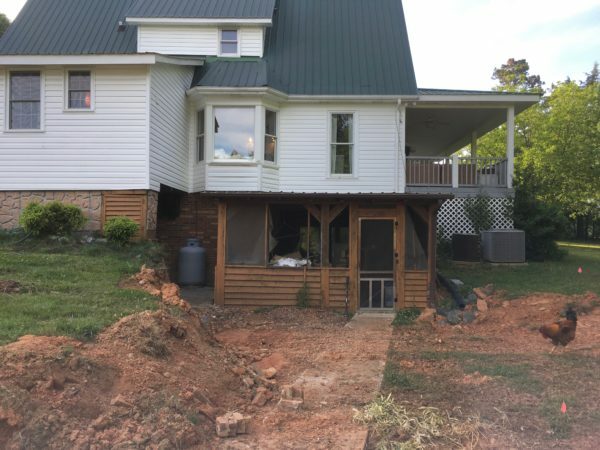 Here’s a shot after the fence and wall had been pulled out, you get a sense of how large that area can be behind our house and outside of that basement porch. 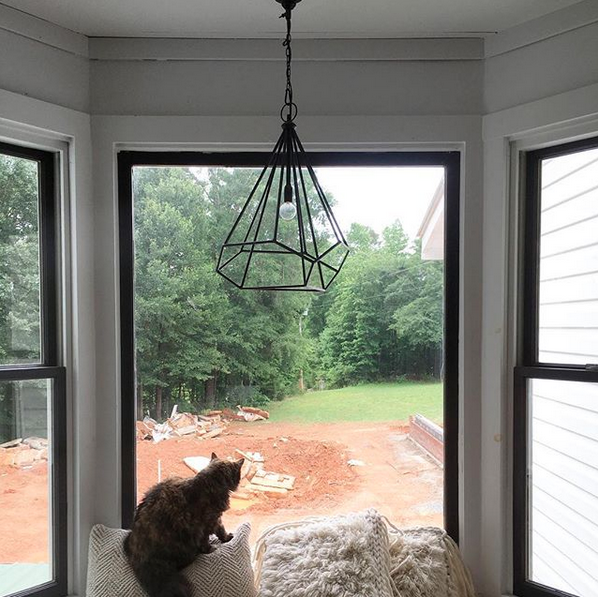 This screened porch area leads to our basement that we hope to refinish one day. #RealLifeFixerUpper — they take years and all of your money. 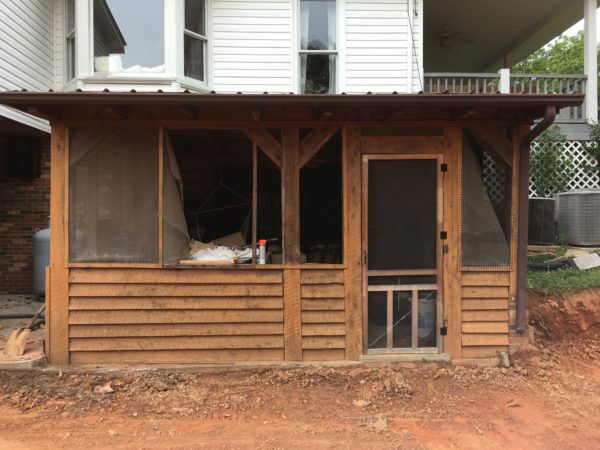 The screened porch after the wall was removed. 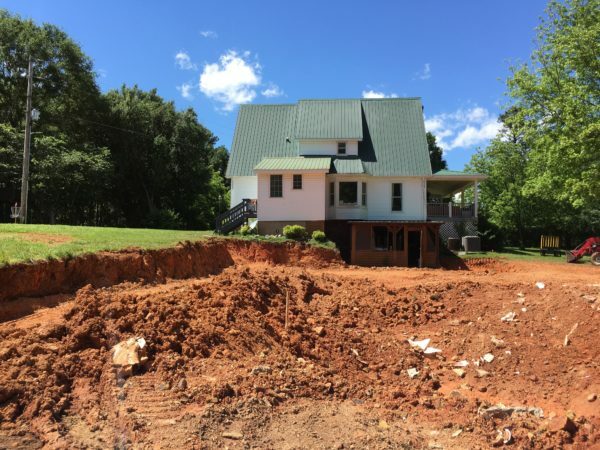 The old retaining wall jutted out all the way to the walkway and then angled back out away from the house. 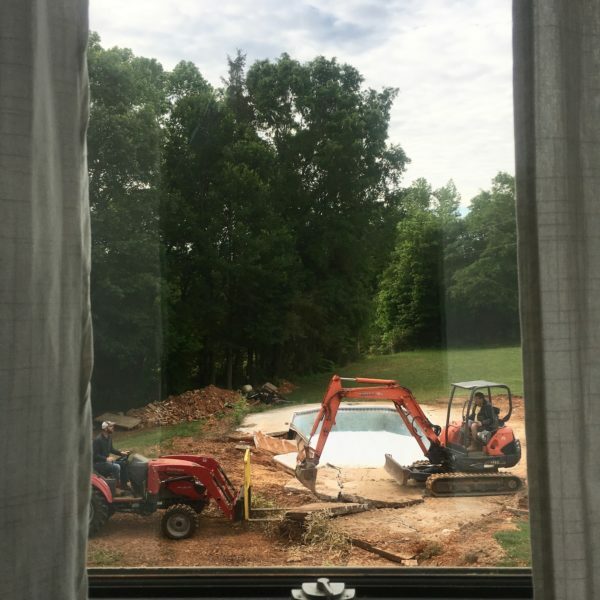 Our view from the house after Chad and Co. removed the pool. You can see some of the new retaining wall there on the right. 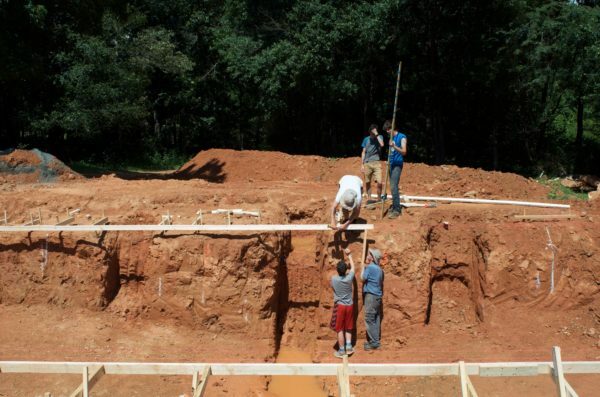 Once the old pool was gone and we saw what we were dealing with, THEN we really started to plan specifics. The piece of plywood back there was what I used to try to envision the fireplace. 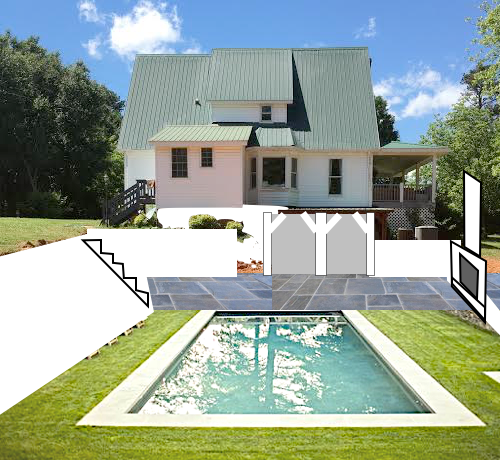 This is the part where we remeasured for the patio, and planned exactly how far the pool would be from the house. We pulled it in a little closer than it was before. Clearly, Italy is not even close to what Midland, NC looks like. 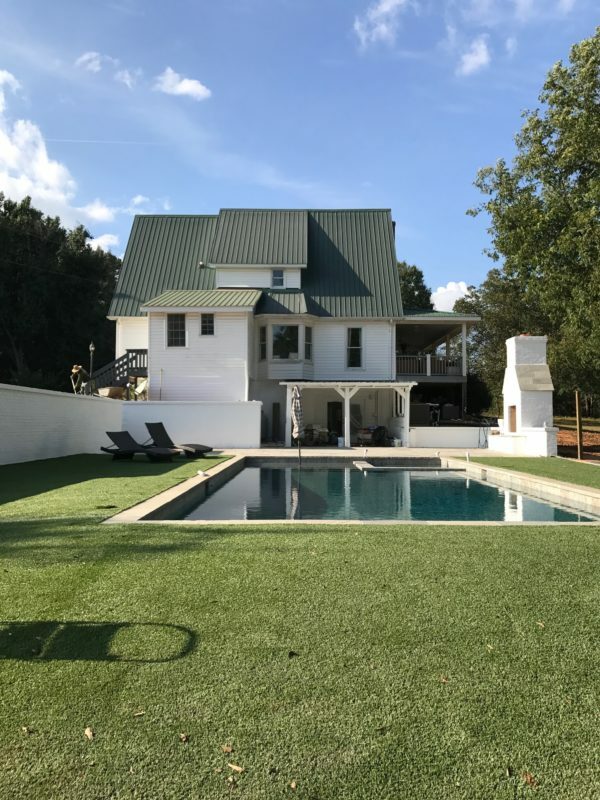 But we loved the simplicity of a rectangle pool with grass on three sides and wanted to interpret that feel for our property near an old sawmill in rural NC. Chad and the mason finishing the main retaining wall. 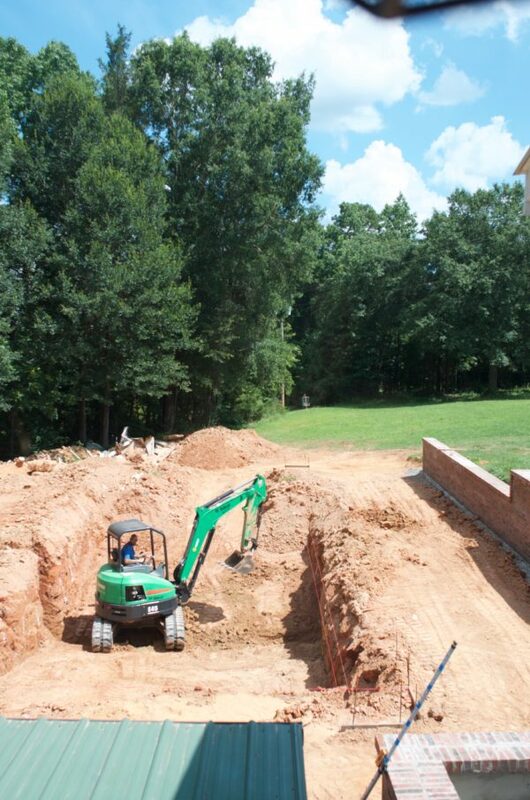 Chad and John digging the new hole for the pool once the main retaining wall was built. 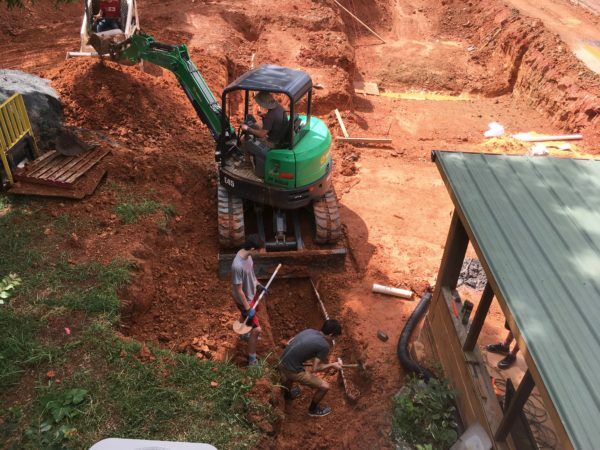 Chad, still digging the hole for the pool. The deepest part of our pool is in the middle there. 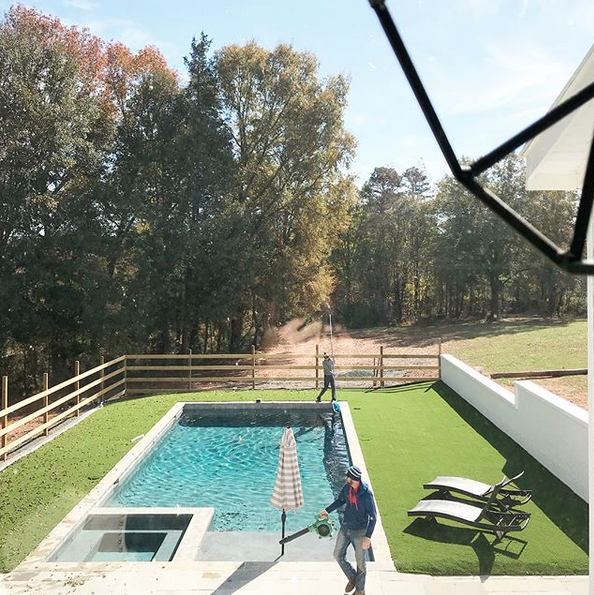 Since three of Chad’s closest friends are a landscaper, a builder and pool designer/pool builder we had access to brilliant pool and landscape minds. Add in John, a teacher who has the summers off and practically lived with us this past summer, and we had a pool dream team that included our three teenage boys and their unsuspecting friends, and my dad when he stopped by. We had a great crew. 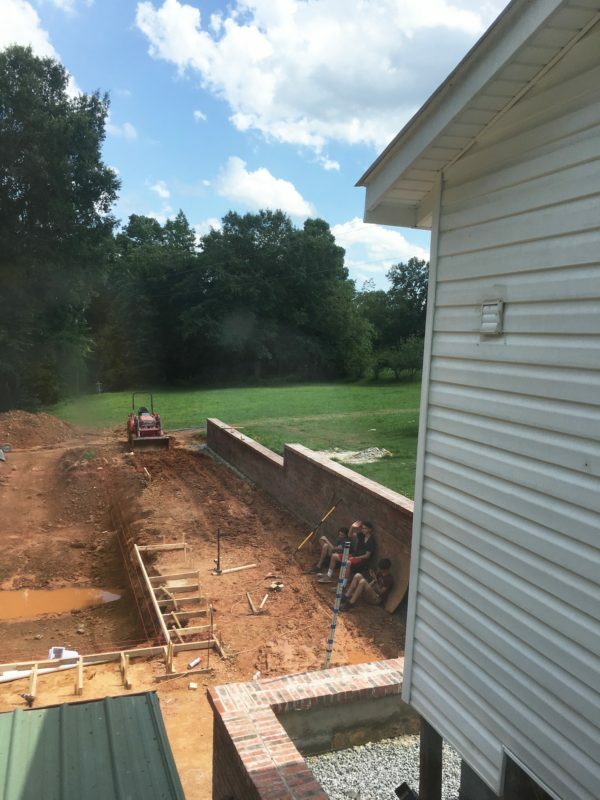 Here they are doing the plumbing for the pool. Y’all, I’m not even going to try to show you seven months of work in the exact order or explain every single decision. 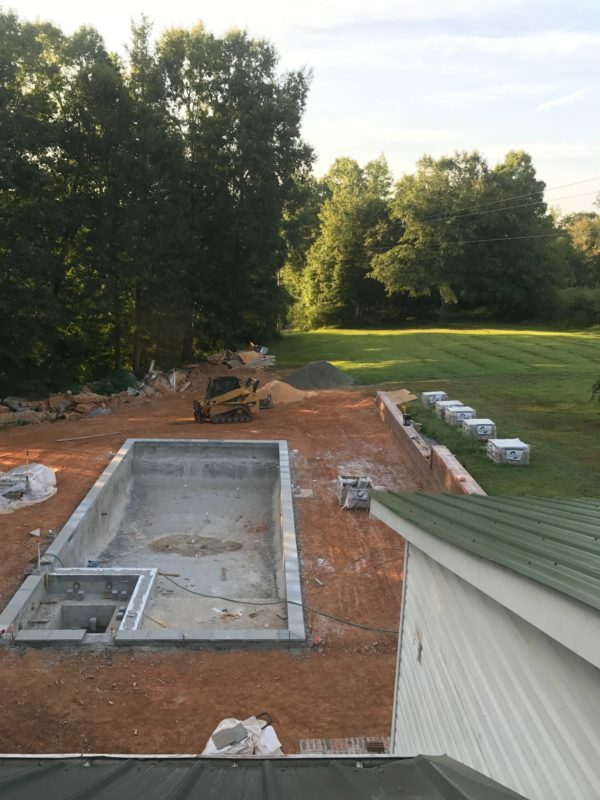 For a few months we/they were just doing things like removing the old pool, removing the old retaining wall on the main side of the pool, moving dirt, and building a new long retaining wall and redigging the pool in its new location and then putting forms in that. It’s lots of red clay, wood and more red clay and machines. 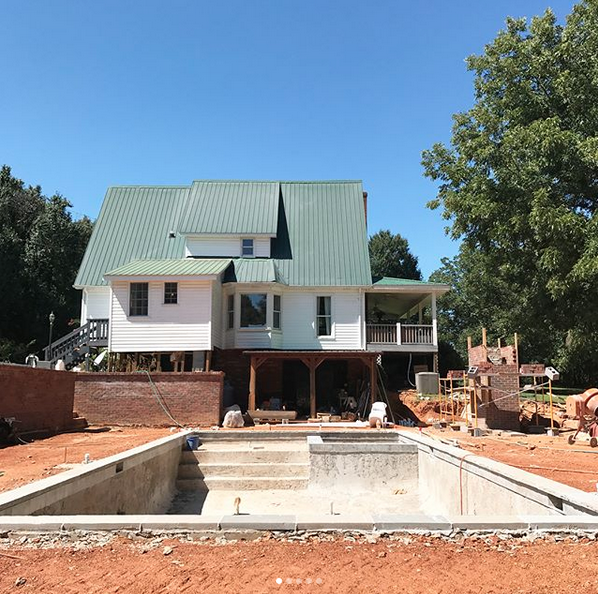 We had the long retaining wall built first–to replace the one we removed, but in order to have more patio space and a flat area, we needed another smaller retaining wall on the opposite side. We decided to add a fireplace to that wall too. I thought of the backyard as an outdoor room. 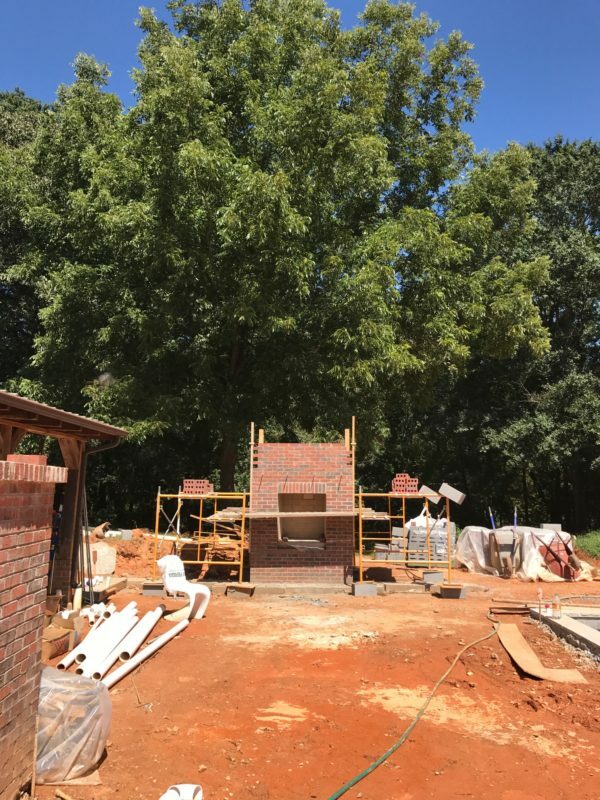 I wanted places to hangout and focal points and since we were investing money into a new backyard, one of our main goals was to be able to use it year around. So we opted for a fireplace on the small retaining wall and a spa in the pool. 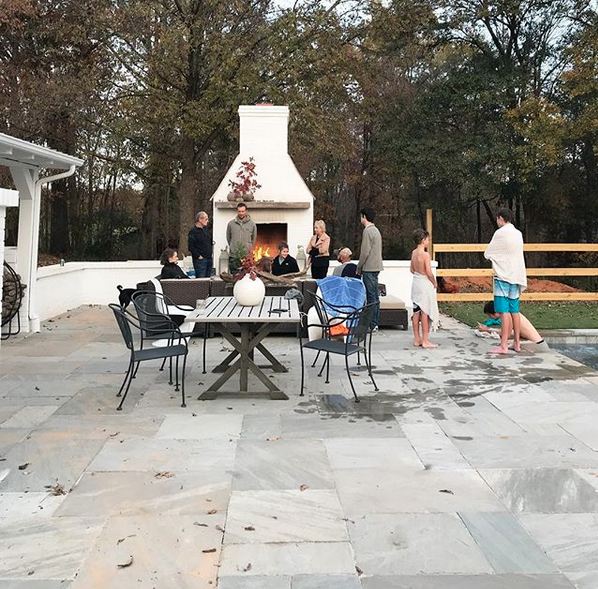 The fireplace and spa were extra time and money but it instantly allowed us to go from using the backyard comfortably half the year to the entire year. 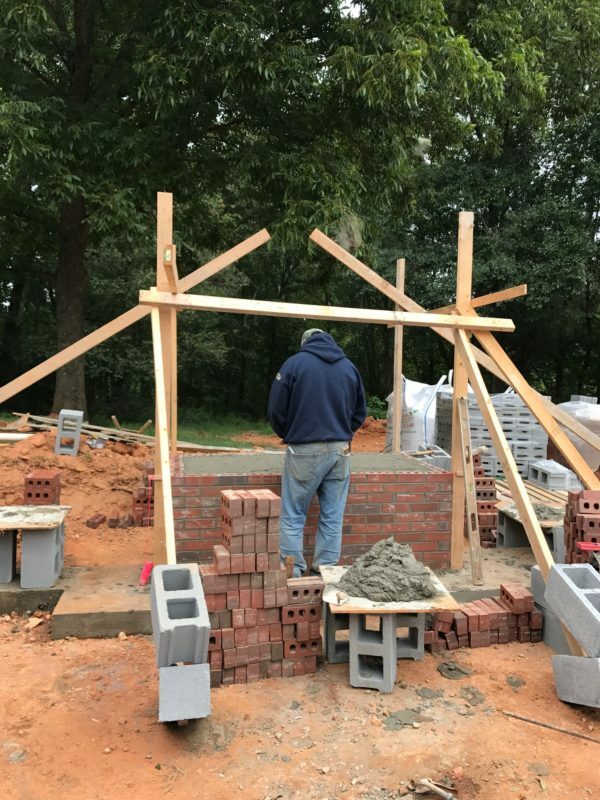 First Jose built the fireplace, then he added the retaining wall on the sides. 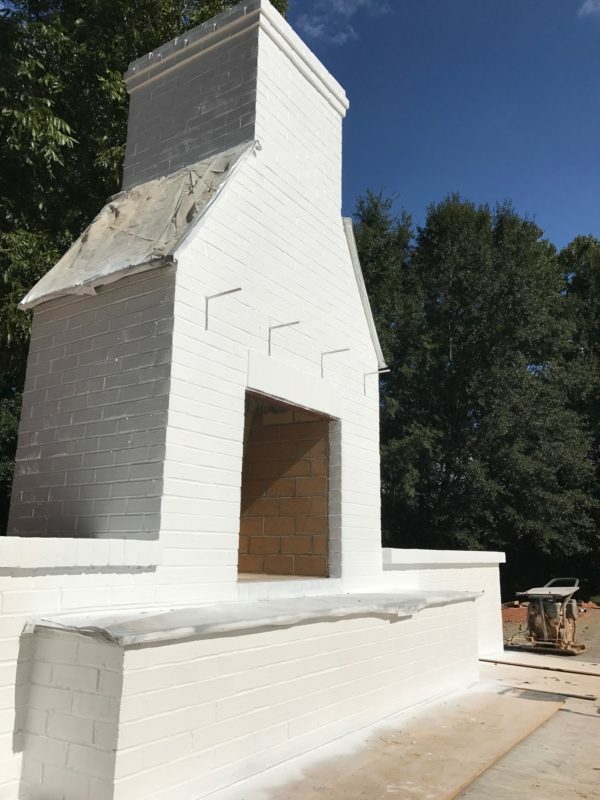 We used the cheapest brick since we knew we were going to paint it. He’s built many fireplaces before so he knew exactly what to do with my random drawing. I had a few goals with the fireplace. And I figured them out by pinning 1.5 million outdoor fireplaces on Pinterest and figuring out what I did and didn’t like. 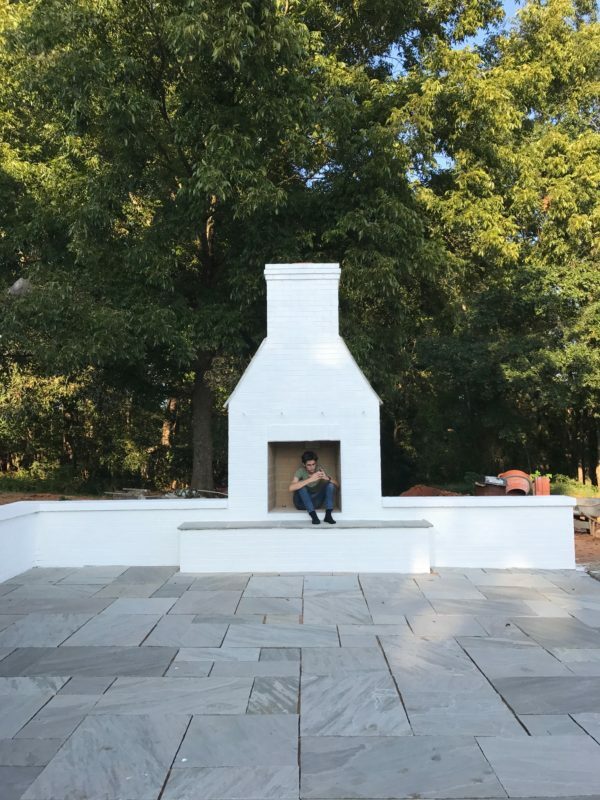 I KNEW the biggest thing that would make the outdoor fireplace look weird was if the scale was off. Anything else could be fixed, but if the fireplace looked tiny, then it would be wasted money. 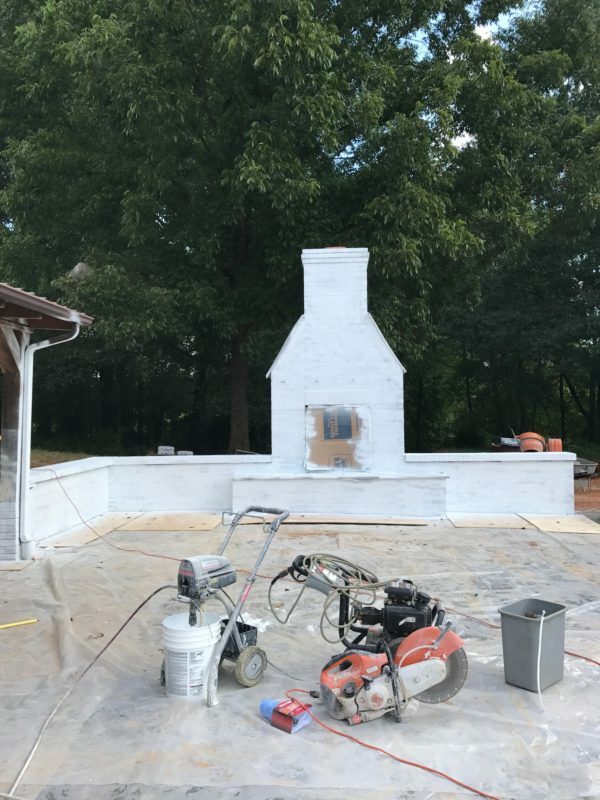 I also wanted the side angles of the fireplace (above the firebox that angle to the chimney) to be reminiscent of our steep roofline on the house. One of the thing that bothered me about the previous backyard was all of the weird random angles with the brick and fence. 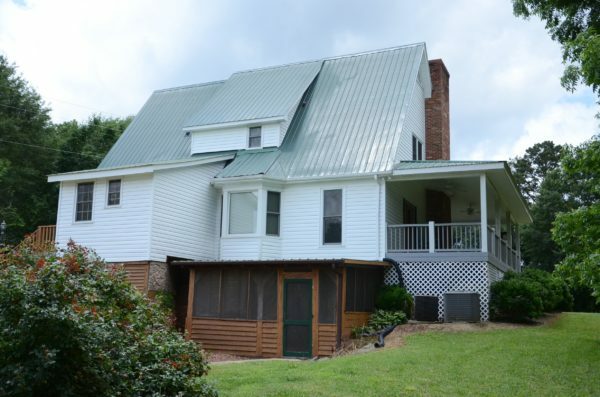 So since we already have a massive, focal point of an angle with our green metal roof, we kept the angle similar. My third goal for the fireplace was that it needed a high firebox. I wanted it to work even if we put a dining table and chairs in front of it, no leaning down to make your smore’s. Meanwhile, the pool was progressing. You can see the outline! The back of the pool was framed and then Chad filled this spot back in with dirt. Once the plumbing was done they were ready for the concrete. 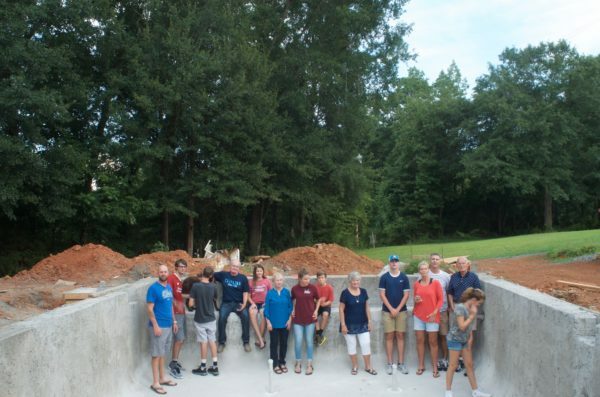 We had hoped to have the pool done before Landis, our oldest went to college, it wasn’t fished but that didn’t stop me from making everyone get in the pool for a photo. 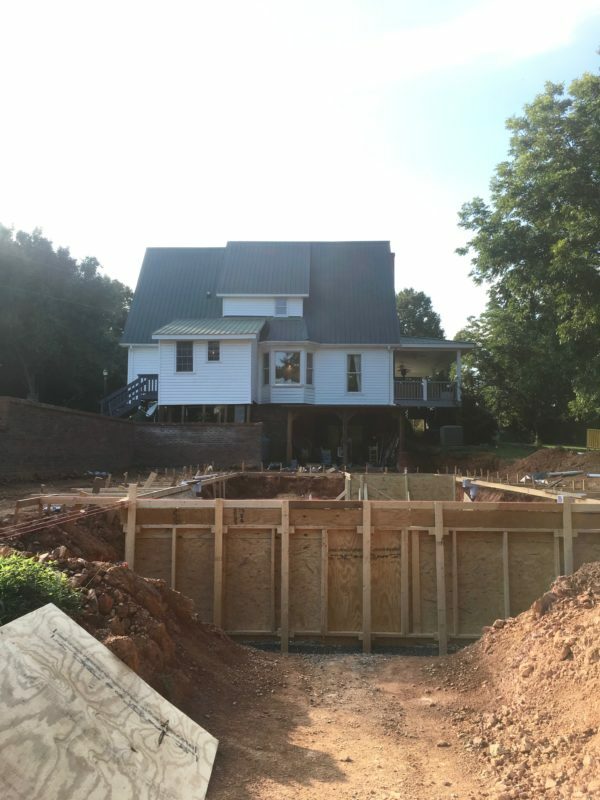 Here you can see the new main retaining wall on the left when you are facing the back of the house. Remember that old retaining wall? 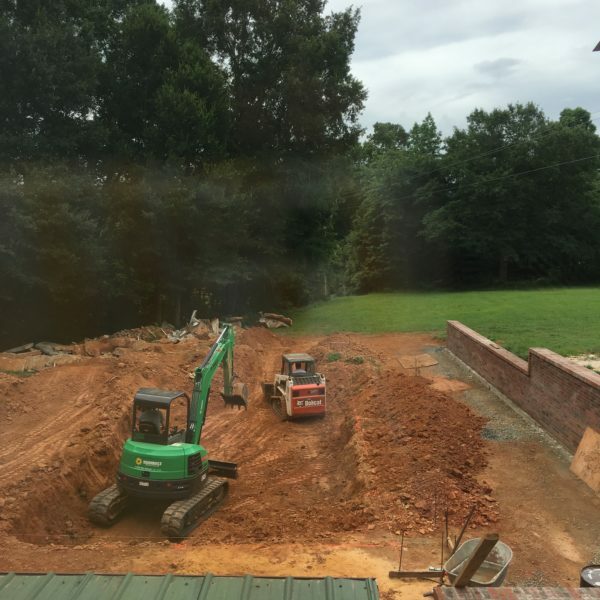 It cut into our yard to the left side of that skinny window–now look at how much room we have! 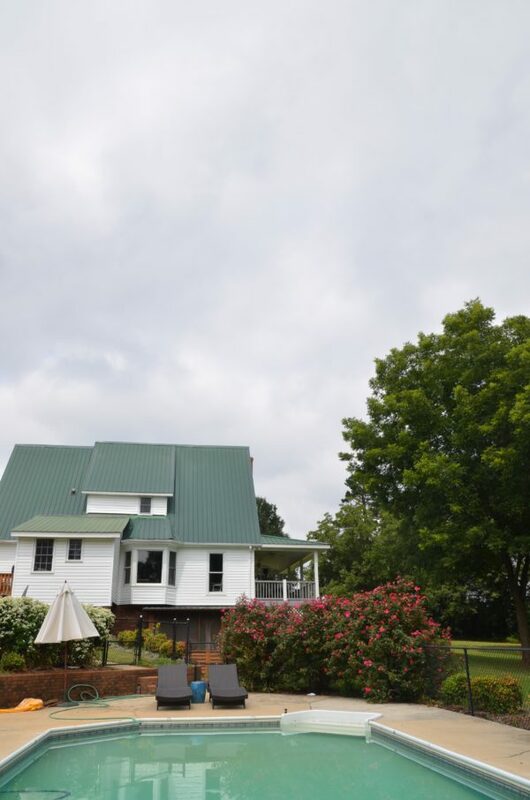 You can also see the pool, the sun shelf on the left and the spa built-in on the right. This is right after the coping and tile were finished. 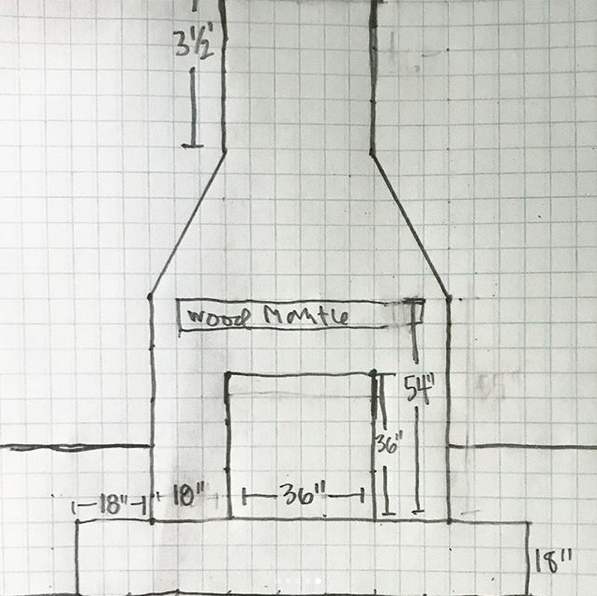 First they built the fireplace like a rectangle and I was all “guys, it’s supposed to have an angle, what is happening?”. I’m sure they rolled their eyes at me and then kindly told me that they make a rectangle first, then cut the brick with a saw. Crazy. And ta-da! 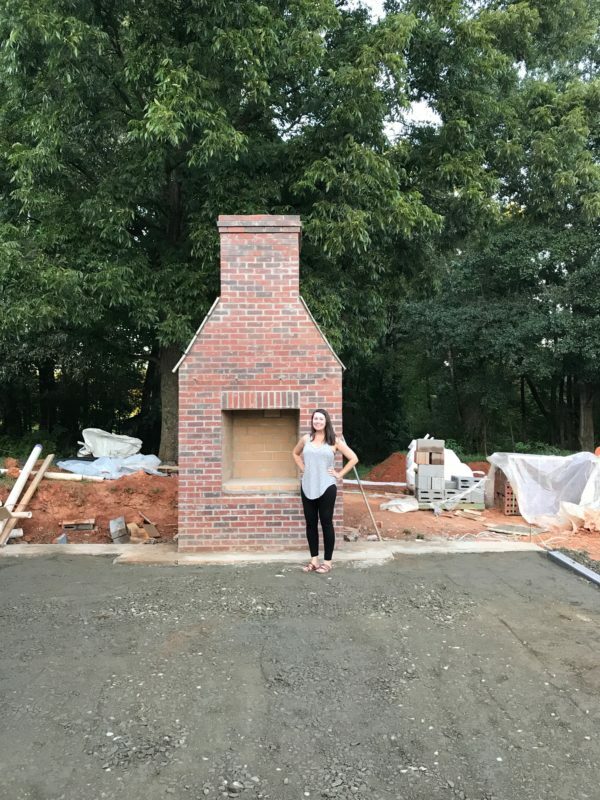 Look at that fireplace! After this, they built the hearth, and the rest of the small retaining wall and then laid the patio. Meanwhile, boring pool things were happening. We’re on the home stretch! 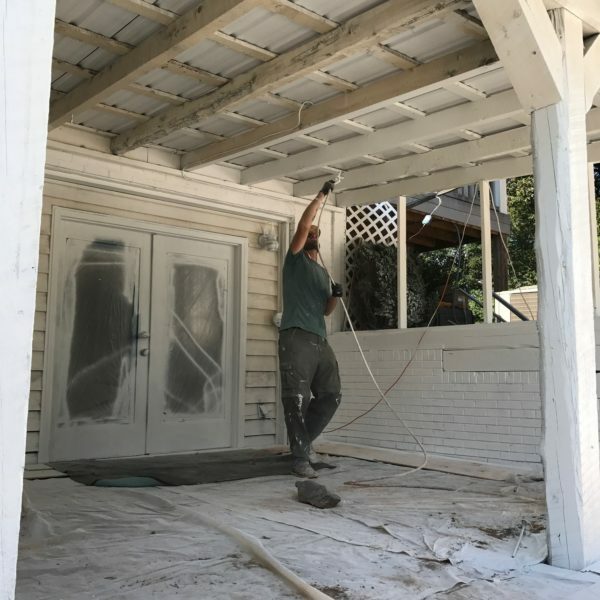 Once the wall was up and the patio was in, Chad started painting. He actually did this all in one day and it was the most transformative day of the entire project. Suddenly, with white paint on the brick basement wall, our house is looking taller. 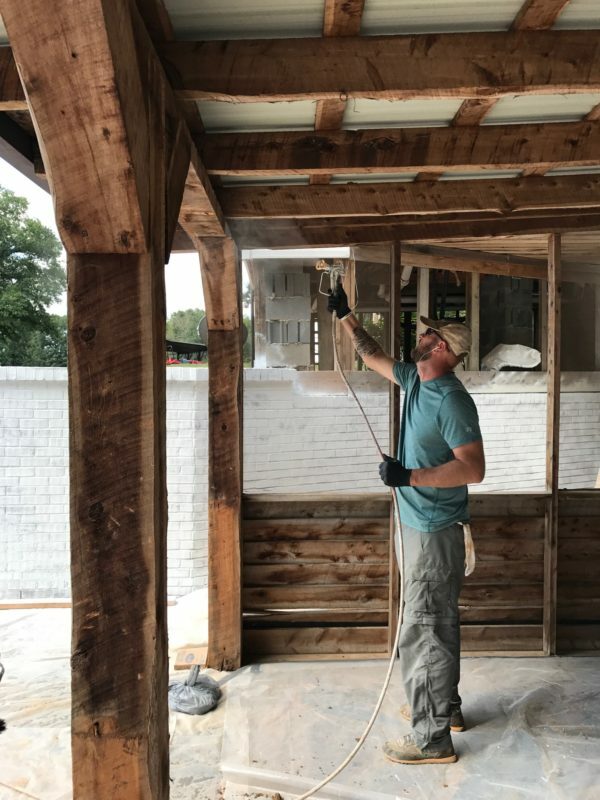 Chad and the boys removed the front walls of the old basement screened in porch and now that opens up to the patio. 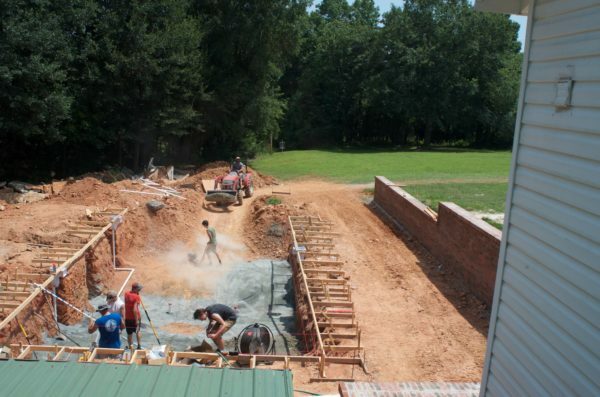 Meanwhile, the pool was moving right along getting ready for plaster. Once we removed the plastic from the patio–the backyard finally started to look like what we’ve hoped for. I moved some outdoor sofas by the fireplace so our kids wouldn’t have to sit in the fireplace. 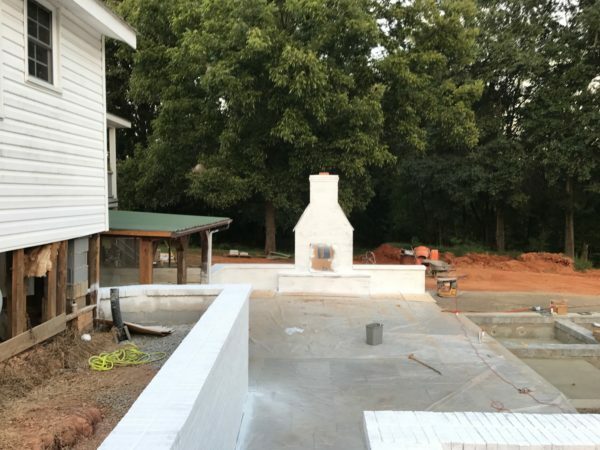 The plaster guys finished out the pool and we filled it with water. Chad and I had to get in that very night. The water is looking greenish here, but no worries, it turned blue. Here it is a few weeks ago–the fence is still in progress, and we’ve done no landscaping, but you get the idea. how about a before again for comparison? We ended up using artificial turf. It’s a long story but it was the right choice for this area and I love it. In the summer it’s the same color as the rest of the grass on the property, in the winter it’s a lush green spot to hang out in. 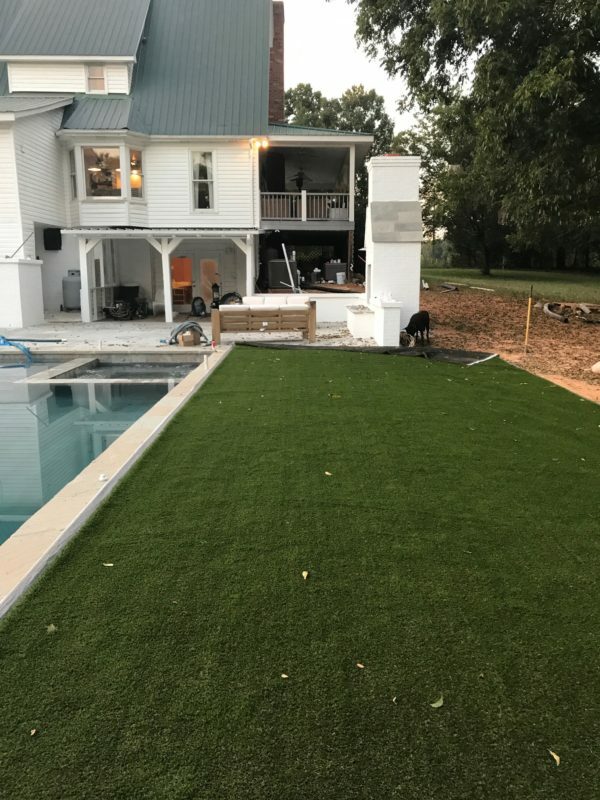 Look how real this turf looks! We ordered this after seeing something similar at The Bradford and loving it. I’ve got all sorts of weird lighting going on, but here’s a view out the bay window in the kitchen. You can see that retaining wall on the right and the turf right after it went down. The pool is a “sport pool” recommended to us by our pool designer and friend, Tell. So the deepest part of the pool (6 feet) is in the middle running from side to side. The far end is 4 feet deep (with a built-in bench at the end for sitting–John’s idea) and the close end has steps from the shelf (9 inch sun shelf with a pipe in it that holds the umbrella) that end at 3.5 feet deep. The pool is 18 feet wide by 40 feet long. The fence is now up on two sides, the fence will also go on top of the retaining wall on the right and I hope to grow vines on it. I wanted a country fence and since we already had a fence like this around our pasture, we decided this fit right in with our country pool. We’ll add metal roll out goat fence? I don’t know, something will get added to the back of it so there aren’t big gaps. And we’ll be painting the fence in a few months. 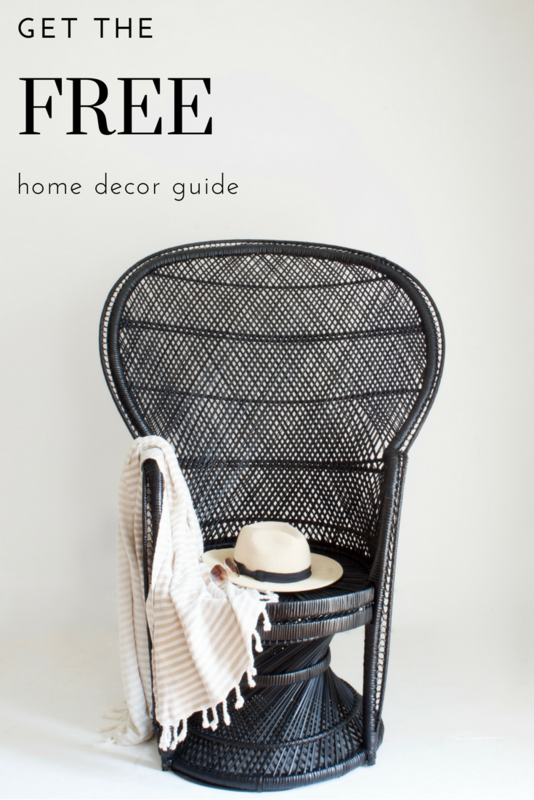 So that’s where we are in our backyard makeover. I love LOVE the extra space it provides. It feels like our house just got bigger. 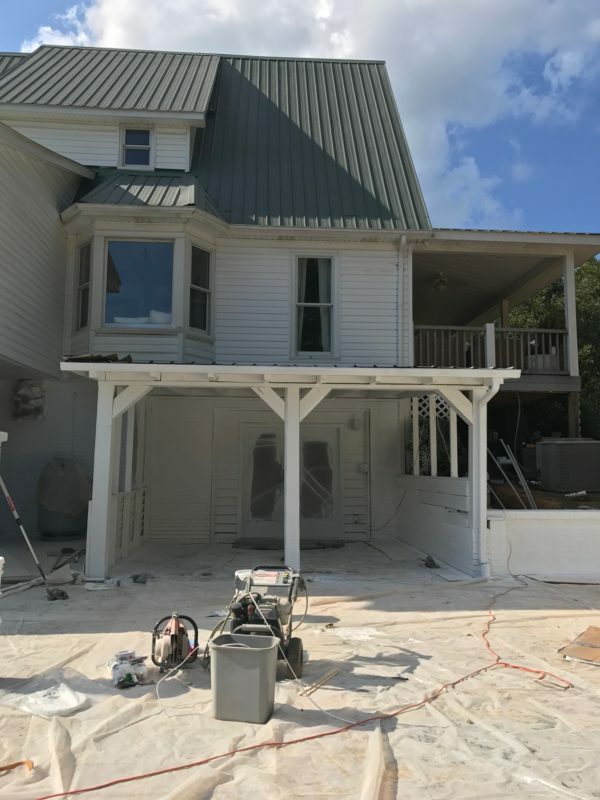 We have some covered area (we call it the underporch–that old screened in porch that we opened up) we still have work to do on that but it’s coming along. We have the fireplace and spa to stay warm. And we have the pool to cool down in. We built the first fire in the fireplace the night of Nest Fest Eve and the whole area earned it’s keep that very night. Here we are on Thanksgiving Eve. Tell Bumgarner // Blue Water Pools (the brain and designer for our pool — he’s too busy and good to need a website so if you want him, you can contact Kurt above (they’re all friends) and he’ll get you in touch with Tell. We used Superior Pool Products for most of our pool supplies and equipment, even the patio, coping and tile. We used Natural Paving Classic Flagstone in Promenade Sandstone for our patio and coping. It’s LOVELY and I love it so much. 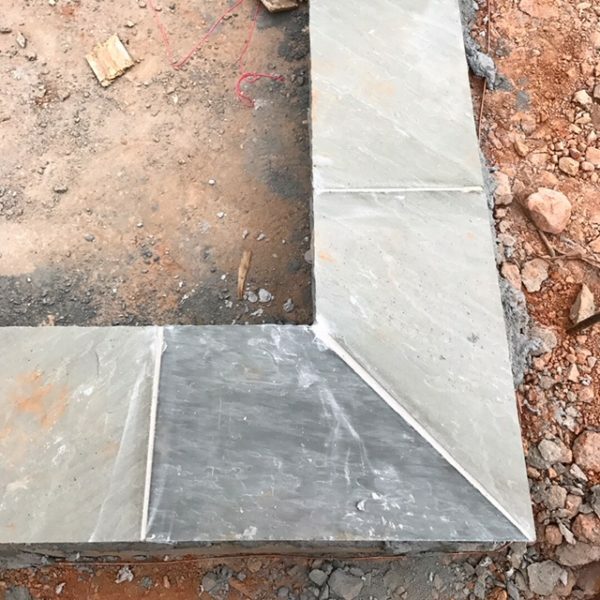 It’s lighter in color than bluestone and doesn’t really get that hot even in the sun. And my husband, Chad was in our backyard every single day. He worked on every part of this pool, had all of the connections and I feel like he built this pool with his own bare hands. This man can make anything. 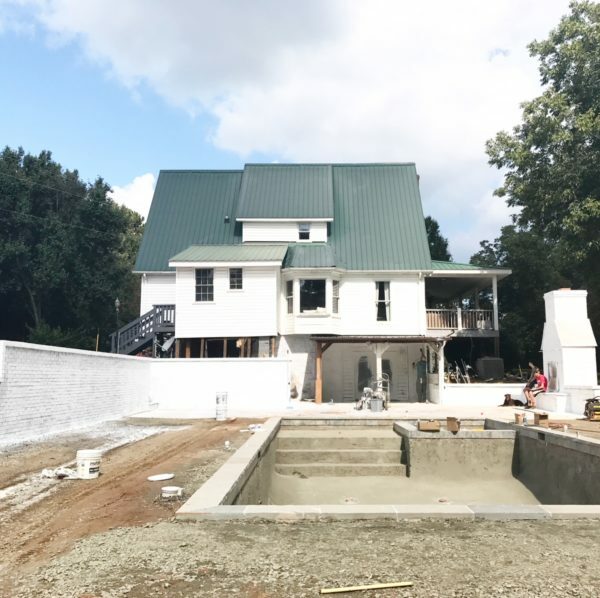 The pool plaster is french gray. It’s a super fine sand type of plaster without any big pebbles. Our pool is 18 feet wide and 40 feet long, we are using a salt system. 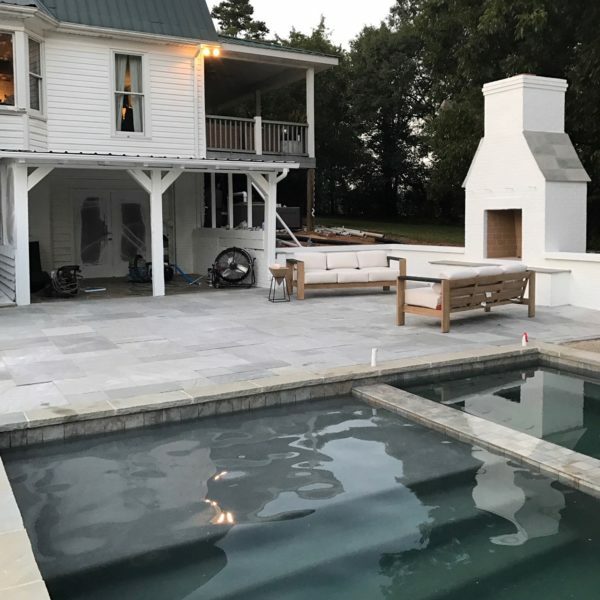 I know how hard it is to find info from real people if you are building a pool, fireplace or patio leave a comment if you have a question and if I can answer it I will! I read every word and stared at every picture! Wow! 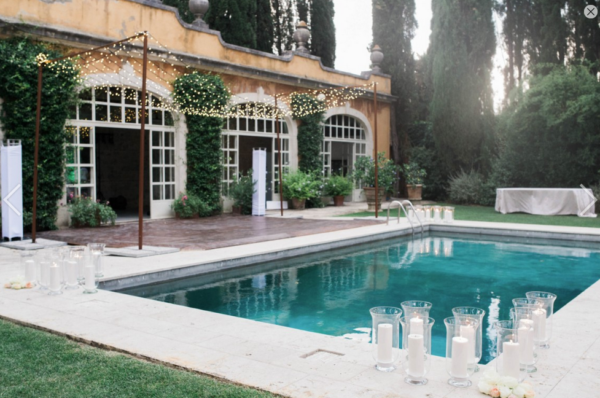 I’m dying to have a pool at our #mixerupper and have already saved this for inspo! We also are so in love with the pool! And the backyard too! Love love love the design of the spa inside the pool. Amazing! You guys worked so hard! What a beautiful space. Thanks for sharing. This post and the one about stockings is why I just love your unapologetic, hilarious, explanatory decorating posts coated in a thick dose of “you do you, I do me” humble tone. I love your blog. Love. In your stocking post you mentioned that you only do stocking gifts for Christmas. 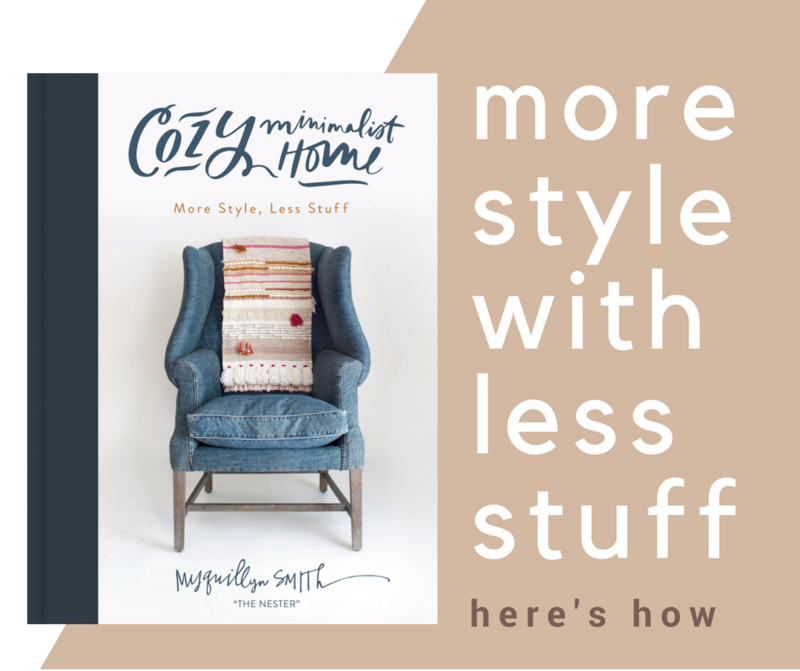 I know that’s probably not a decorating topic, but could you do a post on that? 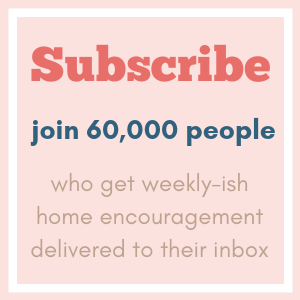 I love to hear how you and your family and your sister’s family lives with intentionality and I want to know more! Very beautiful, a true labor of love!! It’s amazing to watch the drawings on paper get life breathed into them and things go from dream to reality. I am very lucky also to be married to a man who can build and fix anything! We drew our house on paper and then built it ourselves, not a builder, yes it was 2 years of very hard work, now we live here……my real “Barbie” dream house come true. Best Wishes and Fun Memories are wished for your family! Merry Christmas! and thanks for sharing, loved this post!! We’re about to redo our pool and are told we need to add a waterline tile (we don’t have any currently). Did you do this, and if so—have any pics you could share? The pool looks great! Thank you! Oh, so nice!! Thanks for sharing. You have a really lovely area now, and the fireplace is wonderful. 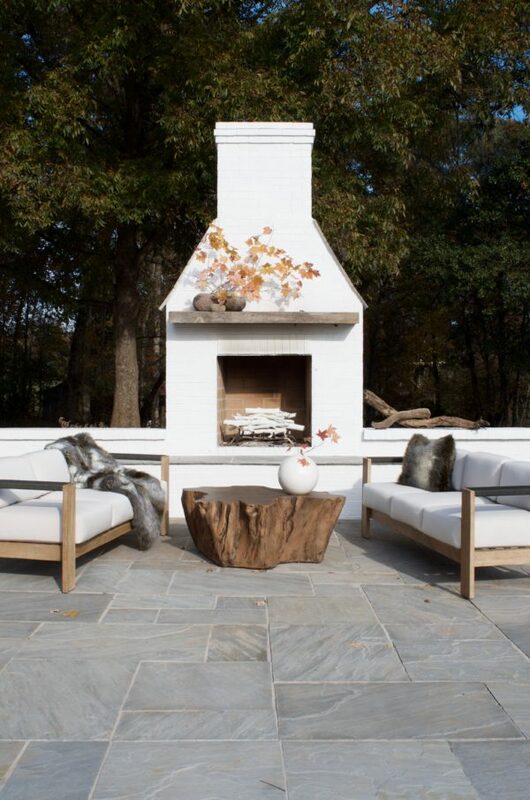 I LOVE outdoor living spaces—I don’t have one but that doesn’t stop me from loving them!! Your pool area Looks like a million bucks…probably was that much. You have come a long way since you first began in your smaller home. I related to you then, not so much now but it’s lovely and I’m sure you will enjoy every bit. Amazing! You guys worked so hard! Beautiful space. Thanks for sharing. 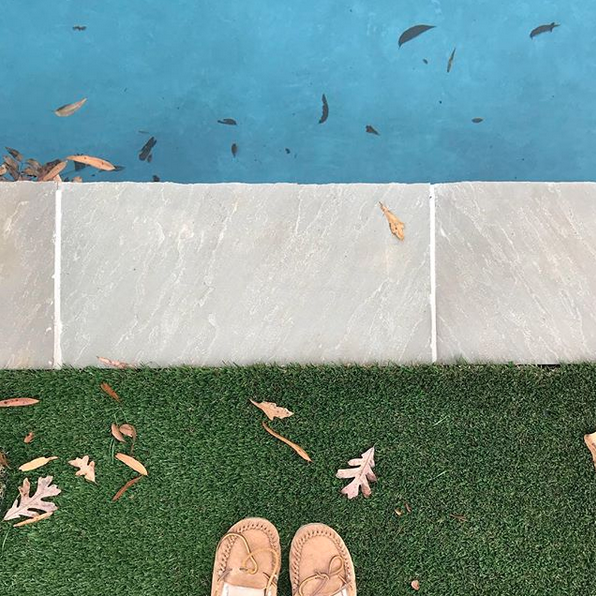 Your pool area is so wonderful and livable for so much of the year! I too, am a pool girl. 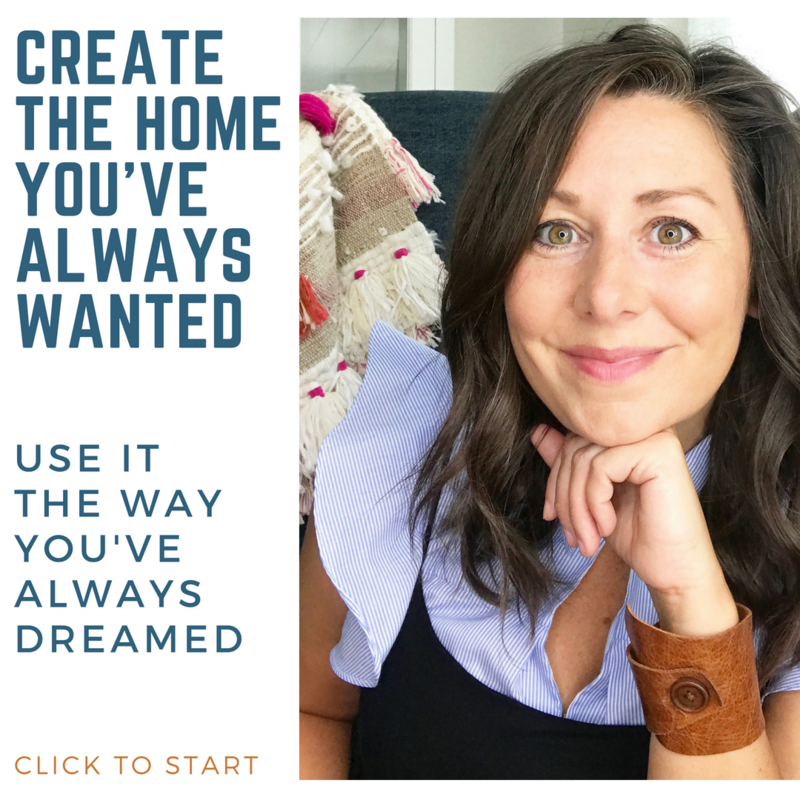 We are in a rental house – one of the reasons I started following your blog. The best thing about our rental house is that we have a Pool! I feel it was God’s gift to me. 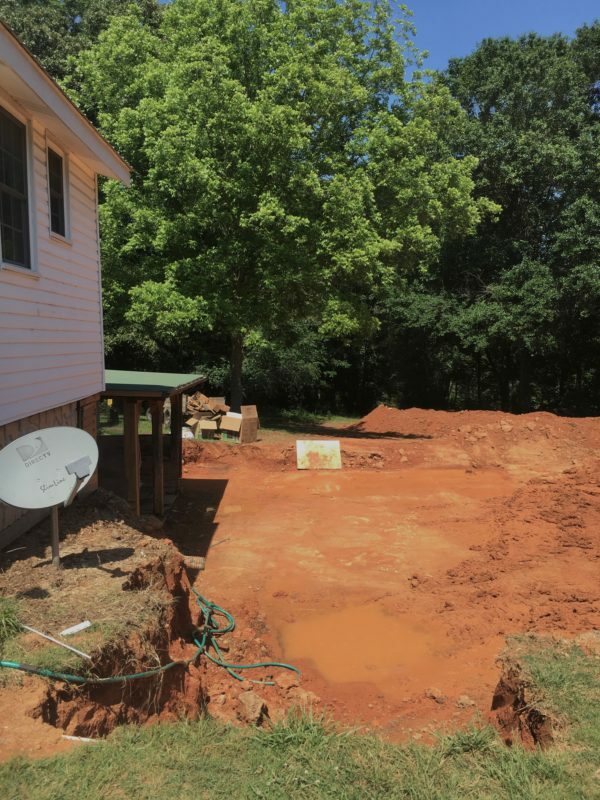 The condition of the pool area is halfway between your before and after – lol. My husband and I open it ASAP in the spring and use it until it’s impossible because of the cold. We use it every day and sometimes twice a day. We also hope to have a place in the country one day. 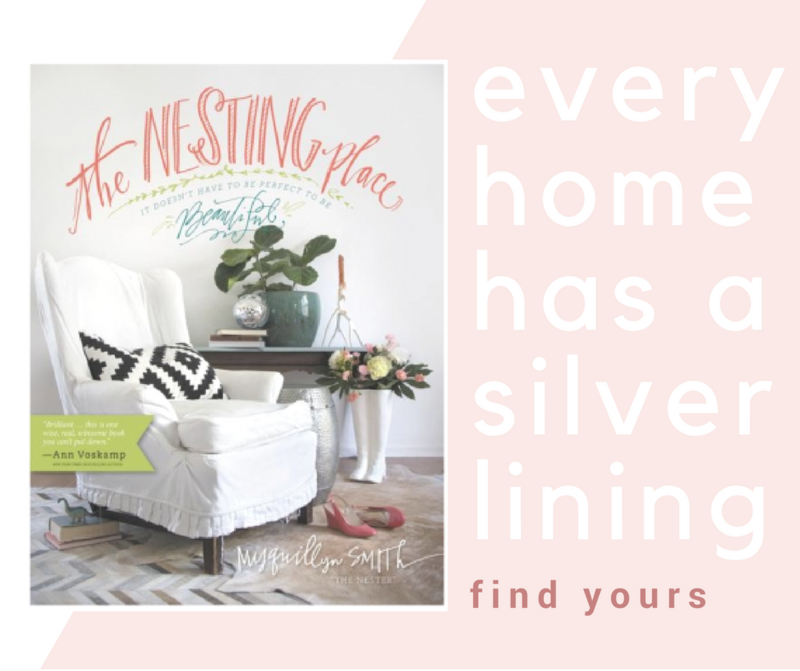 Your blog brings me so much inspiration and hope for the future, as we have experienced many of the same circumstances. And you’re right: It doesn’t have to be perfect to be beautiful! Thank you for being authentic and sharing your experiences. This is very nice architectural design, amazing guideline for fresh designer. I’d love to watch how the backyard makeover in processing. Can’t wait to see the result, it’s great already.